This is my second trek with Adventure Great Himalaya from 6th to 29th October 2018. The first one was in 2015. 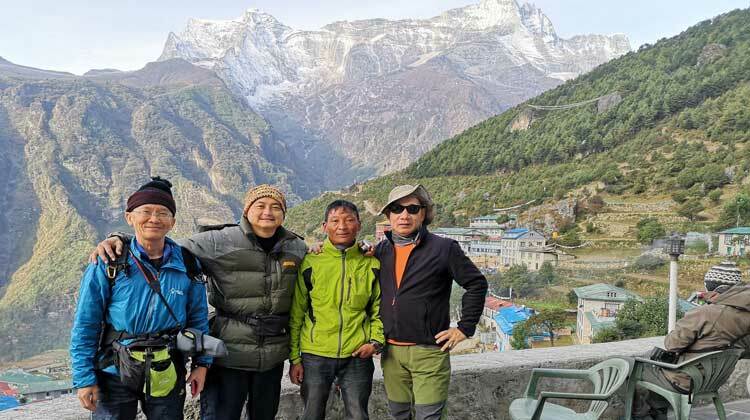 Top marks to Mr Babu and his team for reliable and professional service; the entire trip was smooth and timely, thanks to AGH’s contacts to secure flights to and from Lukla. We never have a problem with lodges despite the peak October month and our itinerary was flexible according to our fitness during the trek. Our guide Lakpa and porters Anil and Ongchu were superb throughout the trip. The in-house Mountain Gateway Hotel in Thamel was excellent for the price, with air-conditioning and hot showers working, located slightly off the busy streets and therefore avoid traffic noise and air pollution. Breakfast was good and substantial. AGH also provided air conditioned car with driver to trips around and outside Kathmandu at very competitive price, cheaper than paying for a taxi without air-conditioning full day.